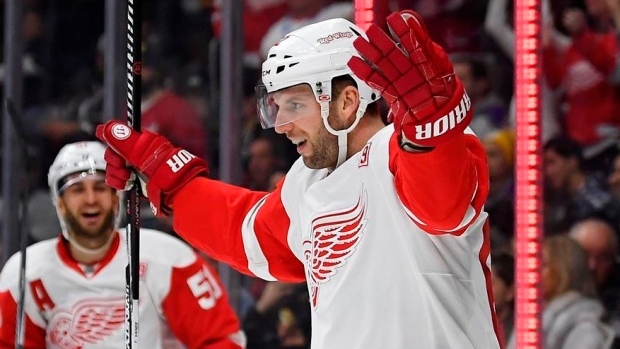 SUNRISE, Fla. — Thomas Vanek grew up idolizing Jaromir Jagr. He's now going to make a playoff push with him. Vanek was acquired Wednesday by the Florida Panthers, who sent defenceman Dylan McIlrath and a conditional third-round draft pick to the Detroit Red Wings for the veteran left wing. It was one of the bigger trade-deadline moves in the NHL, and bolsters the Panthers' offence for their post-season quest. TSN Hockey Insdier Bob McKenzie reports the Red Wings will also retain 50 per cent of Vanek's $2.6 million cap hit. "Now we feel we have three lines that can score," Panthers President Dale Tallon said. "A real good addition to our team, without interrupting our team and not giving up any of our young prospects. All in all, once again buying and improving and adding to the roster to make us better, that's a real positive step for the organization." Vanek had a team-leading 15 goals for the Red Wings this season, along with 23 assists. It's a big move for Tallon, who not only adds a proven scorer in Vanek — with 331 goals in his career — but also a veteran of 63 post-season games. "It's strange," Vanek said. "I talked to my dad earlier, after the trade happened and we were both laughing about it. ... As a kid, I watched the Penguins a lot and Jaromir and Mario were my favourite players. I had posters all over. I'm not the youngest guy anymore, and at 33 to get a chance to be his teammate is kind of surreal." "We've got 20 games," Tallon said. "Let's go get it." Vanek is used to being on the move by now: Florida becomes his sixth different team since the start of the 2013-14 season. Just in that span alone, he spent time with Buffalo, the New York Islanders, Montreal, Minnesota and Detroit — and now is packing yet again to join the Panthers, who have managed just 10 goals in regulation in their last five games. "Is it fun to move around? It certainly isn't," Vanek told NHL Network before the trade became official. "But anywhere you go, the guys are the same. They're all good people. They make you feel welcome ... and I'm sure this will be the same." Talon said he enjoyed the talks with Detroit general manager Ken Holland, who was in selling mode for the first time since becoming the franchise's GM in 1997. He has helped them win four Stanley Cups and extend a post-season streak to 25 years. "We worked the phone for a number of days and I think we got the most we could in every deal," Holland told The Associated Press. "Given where we are in the standings, we need picks to add more players to help our program."